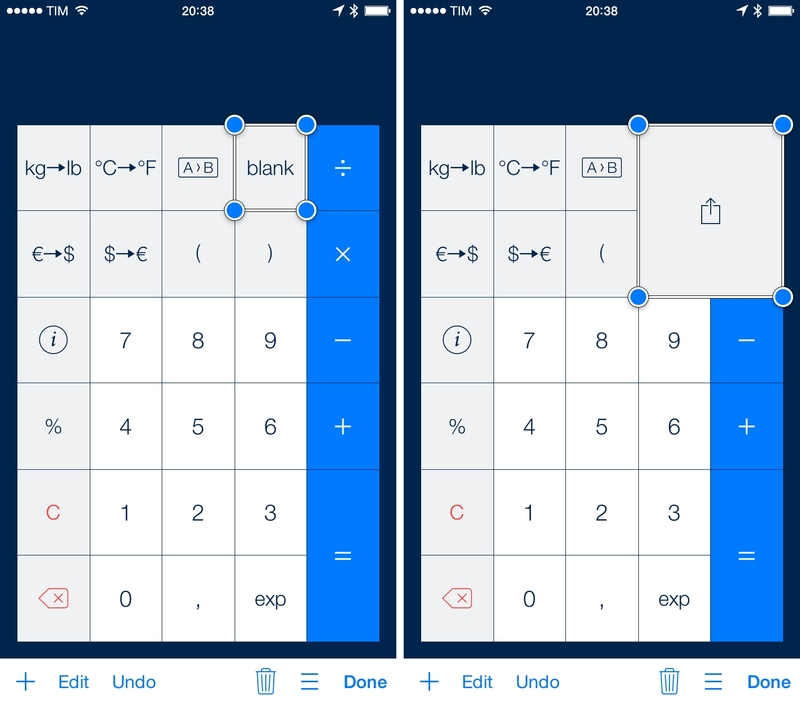 I never thought I'd use a complex calculator app such as PCalc, but, following an iOS 8 update and praise from Dr. Drang and Jason Snell, I reconsidered. PCalc is now on my Home screen and I'm using it on a daily basis for all kinds of calculations and conversions. I've written about my modest calculator needs before: I'm no engineer, I've never been good at mathematics, and all I need to do with numbers typically consists of simple operations and conversions. Living in Italy but working with people based in the United States, I have to convert Euros to Dollars and metric units to the system used in the US. Over the years, I've switched between dozens of calculator apps, unit converters, and even started relying on google.com conversions and Wolfram Alpha queries. I've never stuck to a single system, I believe, due to the friction required to use multiple apps and the cluttered UIs of most unit converters. When version 3.3 of PCalc came out ahead of the launch of iOS 8, I was intrigued by Dr. Drang's coverage of the update. PCalc is a complex app, but it can be incredibly simple and straightforward if you know where to look. I decided to give the app a try: first as a widget, then as a customizable calculator that I can use with my own buttons and functions. I haven't been able to fully grasp the potential of the app's customization for what I need yet, but it's clear that PCalc makes for a great everything calculator. 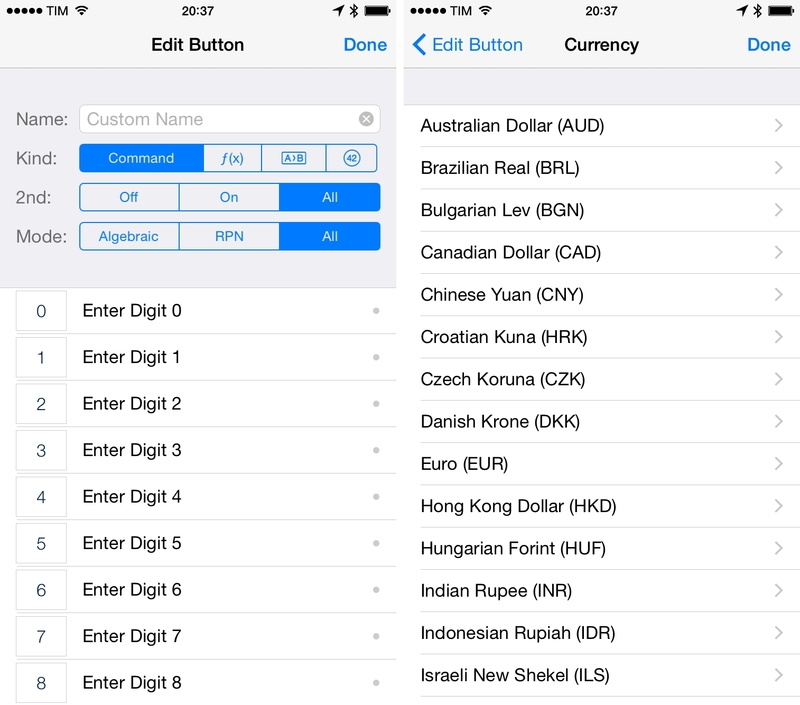 I have created shortcuts to convert kilograms to pounds, turn Celsius to Fahrenheit, and handle conversions between Dollars and Euros. I assigned another button to bring up the full list of supported conversions, and I added a shortcut to show the sharing/note menu for the current tape. I used to keep two separate apps for these tasks and rely on Google and Wolfram Alpha on a regular basis; now, PCalc holds bookmarks for my favorite conversion types and I'm free to change them and tweak the layout whenever I want. 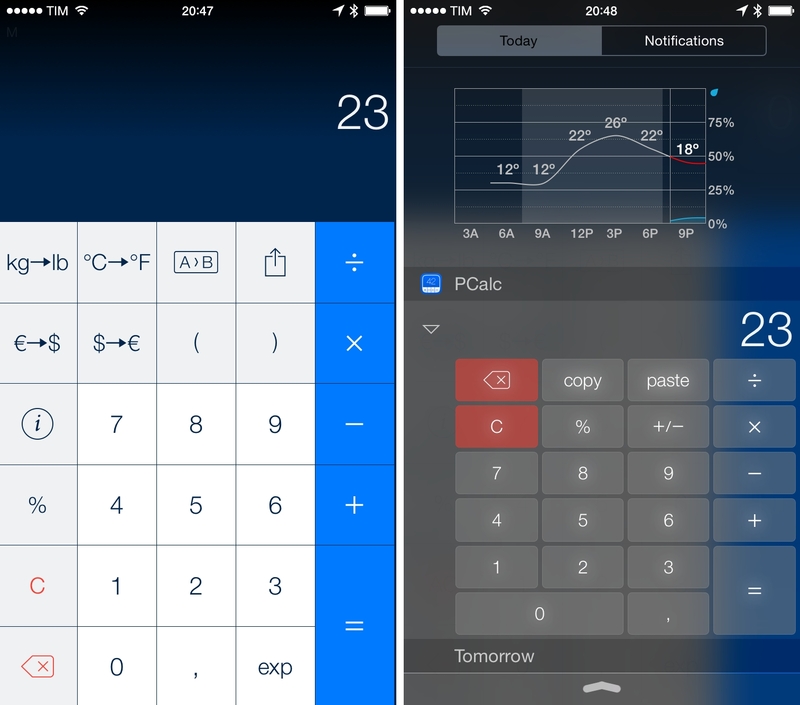 I was hoping that PCalc's Notification Center widget would carry the custom layout used in the app, but, unfortunately, developer James Thomson hasn't been able to add this feature due to memory constraints in iOS 8 widgets. You can activate an option to sync the app and the widget, though, which means that the current result will be shared across the app and the widget every time you open them. I was pleased to see that PCalc uses iCloud sync to make layouts available on all your devices. I created my Italian American layout on the iPhone, but I also wanted to use it on the iPad. PCalc defaults to keeping separate layouts for devices and orientations (portrait and landscape), but you can carry your iPhone's layout over to the iPad by activating the “Use Phone Layouts” option in the Settings. It makes buttons huge, but I don't mind – I like to have the same custom layout every time I open PCalc. Based on the same concept, PCalc supports Handoff on iOS 8: if I want to continue a calculation on my iPad, I can swipe up from the Lock screen and PCalc will hand off my activity (tape and result) from the iPhone to the iPad. There will always be an advantage to using dedicated conversion apps and specialized utilities, but that increases friction and requires you to learn a new interface every time. In spite of the appeal of multiple apps with different designs and innovative features, I've come to realize that I always convert between the same two currencies and I always have to explain my local temperature in Fahrenheit to my American friends. PCalc's integrated and customizable approach works best for me at this point – I just wish I had the Doctor's knowledge when it comes to creating my own commands. Maybe someday. PCalc is $9.99 on the App Store.